In his book Sapiens, Yuval Noah Harari explains that modern humans tend to think of themselves as standing alone atop the pinnacle of evolution, with all the other Homo species (Habilis, Erectus, Neanderthalensis, etc...) being “merely older models of ourselves.” Central to this evolutionary fallacy is our understanding that Homo sapiens and Homo sapiens alone are capable of higher thought. Harari works hard for the next 400 or so pages to undermine the arrogance of man, but he’s hard-pressed to find solid archaeological evidence that points to other species exhibiting things like religion, politics or culture. But now, scientists have uncovered hard evidence that modern humans aren’t the only species capable of displaying one of the most central and complex cultural behaviors: creating art. A study published today in Science describes the first major evidence that Neanderthals, and not modern humans, were responsible for creating some of the world’s oldest known cave paintings. The researchers posit that the creation of cave art act likely involved sophisticated behaviors like choosing what symbols to paint, selecting where to paint them (mostly deep within these underground systems), and mixing up pigments. In short, the findings suggest that Neanderthals had an ability to think much in the same way that modern humans do. The images, which at first might look like the blurry residue of spilled Kool-Aid, are nothing short of stunning. Red lines drawn into groups of animals, geometric shapes, hand stencils, and hand prints, all created more than 64,000 years ago - 20,000 years before modern humans arrived in Europe. Dirk Hoffmann (Max Plank Institute for Evolutionary Anthropology) and Alistair Pike (University of Southampton) collecting samples for dating in Ardales cave. Tiny (less than 10mg) samples of calcite that form on top of cave paintings are dated using the radioactive decay of uranium. 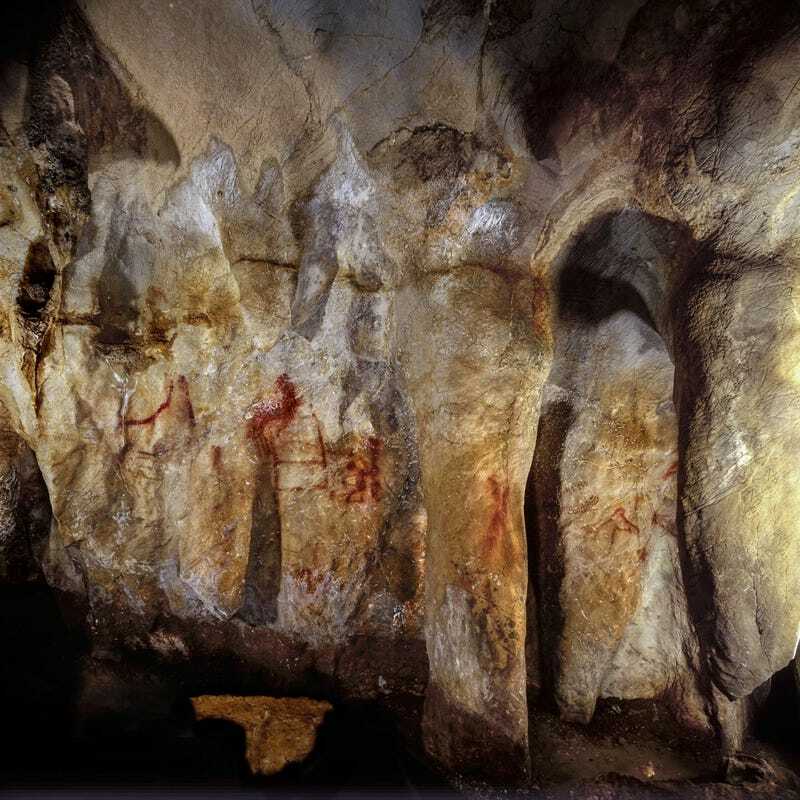 The new study, which was led by the University of Southampton and the Max Planck Institute for Evolutionary Anthropology, used a state-of-the-art technique called uranium-thorium dating to find the age of the cave paintings. The method involves dating carbonate crusts that have built up on top of the cave paintings; by finding the age of the carbonate build-up, researchers can determine the minimum age for the paintings that lie underneath. It’s hard to overemphasize the degree to which this research changes the game for Homo neanderthalensis. When they were first discovered in the middle of the 19th century, anthropologists considered naming the new species Homo stupidus, meaning the stupid human. And while anyone that’s stepped into a modern art museum knows that the creation of art doesn’t make you a genius, the rightful attribution of these paintings to Neanderthals means that modern humans aren’t the only creatures able to put paint on a wall. The study raises questions that could extend beyond Neanderthals; if both Homo sapiens and neanderthalensis were both capable of creating art, why not even older ancestors in the Homo line? Dirk Hoffmann of the Max Planck Institute for Evolutionary Anthropology and one of the lead authors of the study, explained that while there isn’t any evidence of this from the study, it certainly isn’t an absurd assumption that the common ancestor of Neanderthals and modern humans (which likely split over 500,000 years ago) could have had the capabilities of doodling on cave walls.